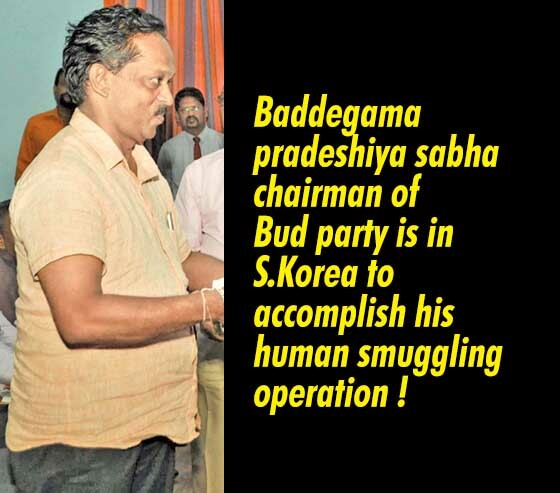 LEN - www.lankaenews.com | Baddegama pradeshiya sabha chairman of Bud party is in S.Korea to accomplish his human smuggling operation ! (Lanka e News -23.Sep.2018, 11.30PM) While Jameel the bearer of a Sri Lankan diplomatic service passport was arrested in Italy for human smuggling , there are reports reaching Lanka e news that a bankrupt politico of the Bud party with a state service passport has gone to South Korea to complete his human smuggling operations. This scoundrel is none other than Baddegama pradeshiya sabha chairman Anura Narangoda who won on the Bud party ticket . Narangoda had collected Rs. 600,000.00 each from three individuals , that is Rs. 1.8 million in all to smuggle them to South Korea via his human smuggling operation. Narangoda is already out of the country with the group to complete his illicit mission. His plan is to leave them there after reaching S. Korea. What is unpardonable is , Narangoda is abusing his pradeshiya sabha position to accomplish his human smuggling operation. It is sure this rascally pradeshiya sabha member who is carrying on this smuggling operation is going to get trapped . It is sure when that happens unfortunately it is the country’s image that is going to be tarnished.